Website traffic is the lifeblood of any businesses. Well, yes! It all starts with traffic and conversion matters. But, if you can’t figure out a way to get those eyeballs onto your website page, then conversions will be the last thing that you will be worrying about. Now, others may need to pay to increase traffic on their site. But then, it’s not the only way to get your target audience to show up. Well, the truth is organic increase traffic converts from ten to thirteen times that of the paid traffic. Clearly speaking, when someone finds you, your product or your service organically, then there is far more motivation to purchase. Wondering why? Well, that is because everyone knows that if Google’s vouched for you, then whatever it is that you are selling or offering must be good. However, whether you focus on organic strategies to increase traffic to your website or you paid for some strategies. You still need to first get a lay of the land. Yes, understanding how you could get that lucrative traffic to show up is only half of the battle. Actually, doing the work to get them there is a whole other ballgame to play. Before doing anything, make sure that you are tracking and analysing your result. Considering that you can’t work on increasing your traffic if you don’t have the bases of where you are starting from. Well, you could use google analytics, google search console, and AMP analytics to track everything. And once everything is humming, you can start tracking your sessions and your landing pages. In this way, you will know how many times people visited your website and what pages they arrived through. Moreover, google search console will allow you to associate keywords to each of those visits, along with how often they were displayed versus how many times they were clicked through. And now that you have the idea on how to track your result, here’s what you need to do to increase traffic to your website. One of the most obvious approach to increase traffic to your website is paid ads. Well, you can simply turn them on like a faucet. But if you are diving into Facebook ads, Google ads or YouTube ads and so on, you need to make sure that your sales funnels are airtight. Otherwise, you are largely wasting your time and money by sending paid traffic to your site. Well, this is when you need to make sure the proper landing pages and funnels that are working to convert your traffic into leads and customers. Without that, you are just wasting your time and effort. SEO may take a number of efforts but you can easily implement an SEO strategy alongside a paid strategy to increase traffic over time. Well, you could hire a good SEO expert support that knows what to do when it comes to search engine optimisation. Well, guest blogging is a pretty straightforward way to grow traffic to any website. As long as you are guest blogging on a site that has a considerable reach, it should generate some healthy traffic numbers for you. Hence, to make it even better, make sure that the guest blog is topical or related to the industry you are in. You might find it hard time convincing popular blogs and bloggers to guest blog on their site. But it will be worth it when one of them agrees. Instagram is a great way to increase traffic to your website. You just need to make sure that you use relevant hashtags when posting pictures or interacting with others. Make some comments on other relevant images from those who have huge followers. Also, be careful not to be too promotional on every post you are leaving comments with. Look for Facebook pages and groups and start commenting and engaging with others. Well, don’t spam and promote; not at first at least. But, comment and be engaged in adds value. And when the opportunity is right, direct them to a relevant piece of content on your site that would help add to the conversation. Well, when you do it right, you will not only add the right eyeballs, but those prospects can quickly turn into customers. This strategy is still one of the best methods you can use. It’s not only for making money online but also, for driving visitors to whatever it is that you are promoting. You could either build your own email list using lead magnets and sales funnels. You can also run solo ads or email list brokers. Just search for the topic plus email list broker in google. Now to increase traffic even more, you may consider sponsoring one of the top marketing conferences out there. Well, this is the fastest and easiest way to reach the target audience. Moreover, you might also want to meet market leaders who could help you with your cause. Well, in today’s trend, influencers in digital marketing are taking the world by storm. Influencers across varieties of social media platforms and even blogs can be your messenger to the masses. While you might have to pay some money to access this medium, you can drive massive amounts of relevant traffic, and ultimately sales, to whatever it is that you are selling. Also, get to know some online marketing strategies to boost traffic to your website. From eBooks to checklists and cheat sheets, or even software trials and beyond, think of a lead magnet you can offer to your target audience. It is a great way to add value while also increasing the awareness for whatever you are selling or offering. One way to increase traffic is to go on a site like Wikipedia and search for broken links. Then, you could replace those broken links with quality content. Well, you can contact the editor of the page to offer up yours as a replacement. It is not guaranteed, but when it works, it’s powerful. And if you have outdated content on your blog, refresh it. Bring it up to date and do some rewrites. Well, expired contents are useless. So, if you have expired one, you should figure out ways to make it more relevant by bringing it current. It doesn’t take much effort after all. Instead, it can help send powerful relevancy signals to Google. And in return, it will increase traffic over time. Yes, infographics are a great way to help increase awareness for any businesses. Thus, creating an infographic based on studies that are relevant to your topic or industry and sharing it to the world could be a great help to increase traffic to your website. You could hire a great designer to build something that has quality and not something that is quickly thrown together. You could also conduct studies or surveys and share them. And in doing this, make sure that they are industry-specific. If you have to, you may consider hiring a professional social media marketing services firm to do this. Go outside the box and tally the market and figure out some of the statistics that could impact your market. Then you could share those with the world. Well, this is very important. Website speed is a big factor to increase your traffic. This will reduce bounce rate and increase the user’s page session time. And to that end, find a good content-delivery network that you can incorporate to help you spread your content across servers all over the world and serve them to the nearest visitor. Also, you may reduce and optimise image and use other services that will help identify performance issues with your site’s speed. Learn some useful website optimisation techniques that you can adapt easily; there are heaps of resourceful articles online. In today’s time, we are dealing with a mobile-first index on Google. But, the obvious truth is that less and fewer people are using desktop devices to access the internet nowadays. So, if your site isn’t optimised for mobile devices, you are risking to lose a huge amount of traffic. Furthermore, having a responsive web design can surely bring you amazing wins! Retargeting pixels are great strategies to increase traffic to your site. Considering that it will be a warm traffic and not cold. Well, warm traffic is more likely to convert. So, make sure to implement a Facebook or google pixel on your website for you to retarget people who visit by following them around with ads. Last but not the least, is to blog your heart out. Well, if you don’t have the blog on your site, then better start having one immediately. Yes, blog and brag about your business to your heart’s content. But never oversell yourself. It’ll look terrible and your audience will just go away. Add immense and sensible value to your site and you will notice an increase traffic coming into it. Be consistent in posting blogs or articles. You can’t just start and stop every few weeks or months, considering that it won’t help. Well, these are some of the many strategies that you can do to increase traffic to your website. In fact, getting more website visitors will not happen overnight and it takes a great amount of effort to be seen online. It takes hard work and dedication. On the brighter side, we have eliminated the hard part for you by letting you know what to do in the very first place. 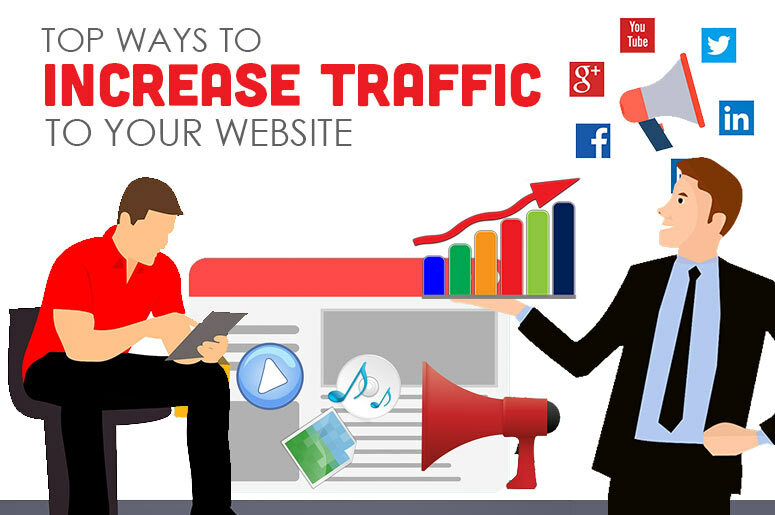 Try implementing some of the above strategies and you will start seeing improvements in your website traffic. Check out our blog section for more insights and updates. You may also contact Aleph IT’s customer service for inquiries and concerns and our team of professionals will be more than happy to assist your needs. Learn more of our services by browsing our website. Also, are you having second thoughts on hiring digital marketer? Then, we recommend you to read this article. “Signs That You Need Digital Marketing Strategy Services”. This entry was posted in SEO and tagged Increase Traffic.